Cecilia Sáenz Becerra, the RWV Regional Field Manager, works with RWV’s network of 31 regional coordinators to build states’ support for Medicaid Expansion, advocate for policies that support access to comprehensive reproductive health services, and ensure that women know how to enroll and use their coverage. We will be profiling the regional coordinators in forthcoming issues of the WHA, to highlight their important work. The NWHN hosted a convening in DC last fall, which included a White House briefing for the coordinators. The ACA has been hugely successful in expanding health insurance coverage, especially for low income women. Over 50 percent of those enrolled in Marketplace plans are women, and 80 percent of them needed — and got — financial help to pay for coverage. But, we’re hearing that women need more information about what to do once they’re covered: how to use their insurance, find a doctor, and understand what’s covered. RWV just released new print and on-line heath literacy materials, including My Health, My Voice: A Woman’s Step-by-Step Guide to Using Health Insurance. The first run of the guide has been snatched up already, and the Obama Administration is poised to feature it in its outreach efforts, including the White House ACA Open Enrollment Kickoff event held on October 26, 2015. Cecilia Sáenz Becerra is leading a Spanish-language adaptation and translation of the guide. Despite Republican attacks on reproductive rights, the NWHN and our allies are working hard to build support for the Equal Access to Abortion Coverage in Health Insurance Act (EACH Woman Act). The Act would repeal the Hyde Amendment and ensure women have access to abortion care regardless of where they live or how much they make (see our Feature Article for more on the bill.) Christina Cherel, NWHN’s Program Coordinator, led a NWHN team for the October 22nd EACH Woman Act Lobby Day, including current and former Board members, interns, and staff. Together, we visited more than 25 Congressional offices. We’re currently working to get a companion bill in the Senate. Sign up for our e-alerts to follow this issue and find out how you can help protect women’s reproductive health (https://www.nwhn.org/health-information/e-alerts)! The NWHN was disappointed that the FDA approved flibanserin, the new drug to treat “female sexual dysfunction” — and we’re making our voice heard to express that disappointment. The NWHN has been featured in a significant amount of media coverage of the new drug, the lack of information about its interactions with hormonal contraception, and the health risks to women who use it. We have a new Fact Sheet, Top Ten Things Women Need to Know about Addyi, for women who are considering the drug (add URL), and a current Change.org campaign, building support for our efforts to get the word out about this risky and ineffective drug. Christina Cherel recently testified at the Food and Drug Administration (FDA) about the need for more studies of the interaction between hormonal contraception and a whole range of medications. It is crucially important for women to know if their birth control makes flibanserin’s complications more likely, for example, or if the drug makes birth control less effective. We are also urging the FDA to think carefully about how to respond to a group of well-known gynecologists, who petitioned the agency to remove warnings about blood clots and stroke from low-dose vaginal estrogen products. 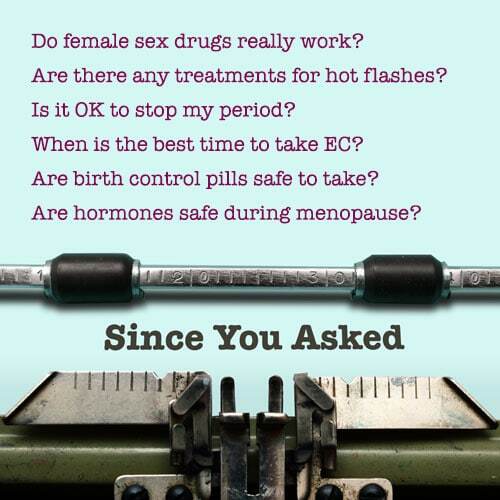 The current label warns about dangers of estrogen and estrogen-plus-progestin products used for menopause hormone therapy, regardless of the dose or delivery method (pill, patch, ring, or cream. It took activists nearly 30 years to get the right studies done about HT’s potential harms to women, which include stroke, blood clots, and breast cancer, and including this information in the label of all estrogen HT products has helped women avoid exposing themselves to these risks unnecessarily. In November, Cindy Pearson testified before the FDA that women need sound information and that product labels should represent the best evidence available. Women using very low doses of estrogen to relieve vaginal symptoms may not need the full-blown warning label, but they do need accurate and useful information on which to base their health care decisions.